Market research firm IMV Limited has published a new series of infographics offering ServiceTrak Scores that rate customer satisfaction with diagnostic imaging equipment. The infographics for the diagnostic imaging modalities can be viewed at http://servicetrak.imvinfo.com. 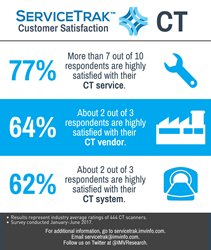 "We developed this new infographic series to give users of diagnostic imaging equipment an easy way to visualize customer satisfaction in the industry," said Scott Lamb, senior project manager, ServiceTrak. "Potential equipment buyers can review the overall industry scores and ask their potential vendor for their own ServiceTrak Scores before purchasing a new system." The new series is based on IMV’s ServiceTrak reports for the first half of 2017, which were published in July and August. Telephone interviews were conducted with radiology professionals representing more than 3,100 imaging systems for CT, MRI, nuclear medicine (SPECT), PET, general ultrasound, echocardiography, and x-ray systems (cath, angiography, mammography, general rad, and R/F). Vendors covered in the ServiceTrak Imaging Reports include GE, Hitachi, Hologic, Philips, Siemens, and Toshiba. Separate reports are also provided for laboratory, radiation therapy, and patient monitoring. IMV Limited is a marketing research and consulting firm founded in 1977, specializing in medical imaging, laboratory, and other advanced healthcare technology markets. IMV’s marketing research services, in combination with its databases of U.S. laboratory and imaging sites provide clients with valuable assistance in strategic planning, customer satisfaction, product development, and sales initiatives.